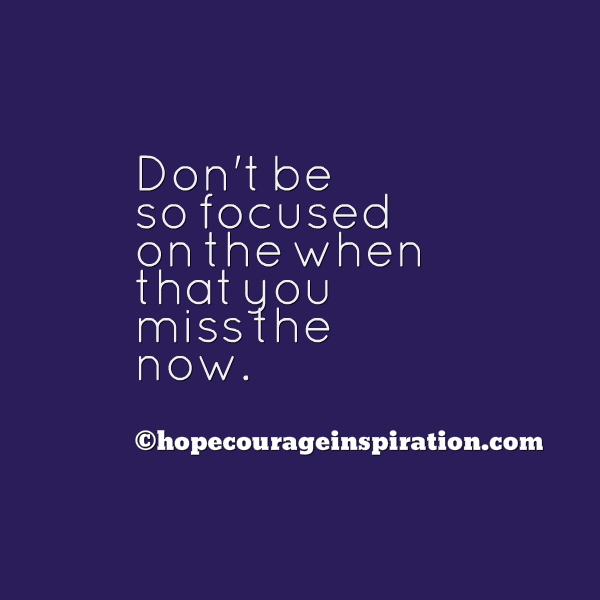 Don’t be so focused on the “when” that you miss the “now.” Planning is important but not so much so that you miss the vibrancy of the present. If you look too far on the horizon, you miss the opportunities that are right in front of you. Similarly, staring at the panorama misses the blessings at your feet. Resist living for the “when” because you sandbag the joy of today and forego the blessings that are within this very moment. You’ll never reclaim the hours spent wishing away the present for a moment in the future; that is precious time wasted. Keep your eyes wide open on the beauty of now; the now is bursting with life and is just waiting to be enjoyed. There are blessings in the now, even in the challenging moments. Seek them, identify them and hold onto them. Choose to embrace the now. Move the needle of purpose forward. Make use of every opportunity and seize every moment of joy that is here and now. Live life fully present. “Choose to embrace the now.” YES!!! !